Food Librarian The Food Librarian: Pumpkin Muffins with Cream Cheese Filling! 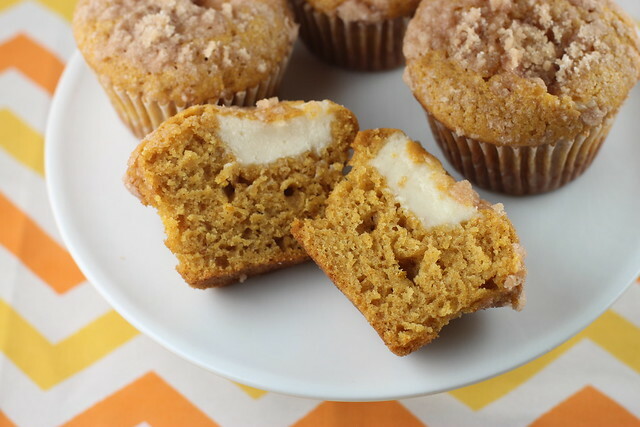 Pumpkin Muffins with Cream Cheese Filling! Here's a muffin that fits in with the season! (Unless you are in Los Angeles right now and experiencing huge Santa Ana winds and lots of heat). Cidney the Girl Dog is going to be a Bumble Bee. Yes, there is even a little video. Yes, I'm obsessed. But let's move onto the muffin. This muffin has cream cheese. 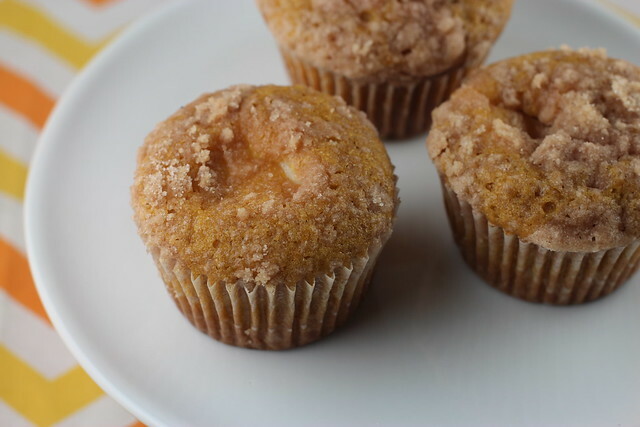 This muffin has a streusel topping. The muffin was moist, but I think I can get away with a smidgen less oil. Next time I'll try that and let you know. These were really loved at my meeting...you should treat your co-workers to some! 1. Preheat oven to 375°. Prep muffin tins with paper liners - this recipe makes 24 muffins. 2. 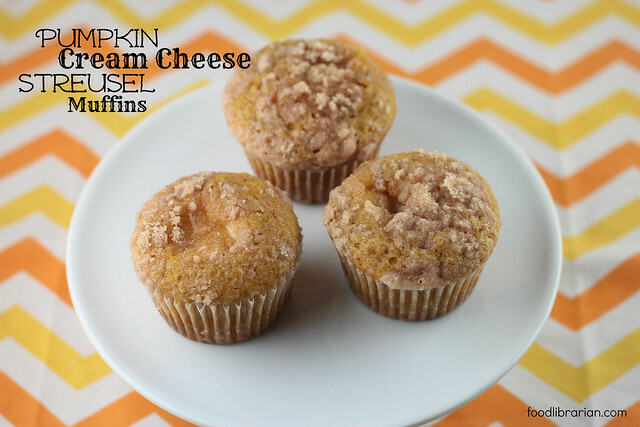 Cream cheese filling: Mix together cream cheese, vanilla extract, and 1/2 cup sugar in a medium bowl. Set aside. 3. Streusel topping: Combine 1/2 cup sugar, 1/3 cup flour, and 1 teaspoon cinnamon in a small bowl. Using a pastry blender or a fork, cut in the butter until large crumbs form. Place in refrigerator until needed. 4. 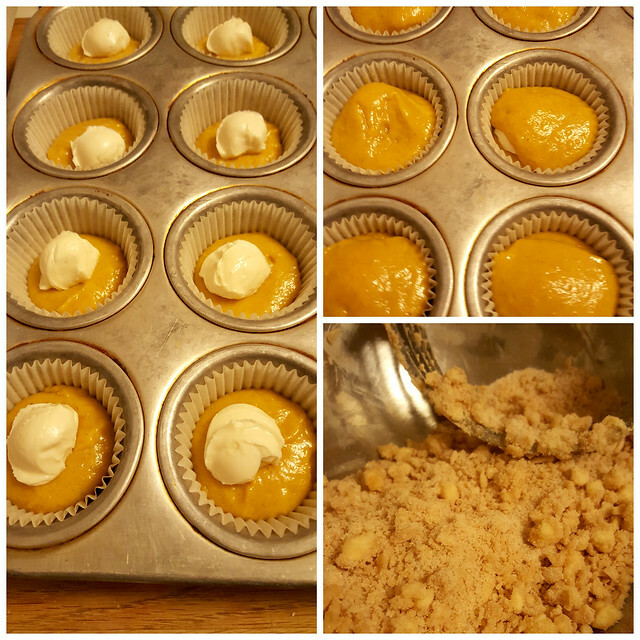 Muffins: In a large bowl, whisk together 3 cups flour, 1 3/4 cups sugar, pumpkin pie spice, baking soda, and salt. In a medium bowl, whisk together eggs, pumpkin, oil, and milk. Fold egg/pumpkin mixture into flour mixture until just moist. Don't overmix! 5. Spoon batter muffin pan, 1/2 way to top. Dollop about 1 tablespoon cream cheese mixture in center of batter (I used a small cookie scoop), and top evenly with remaining batter until muffin is 3/4 full. Sprinkle top with streusel mixture. 6. Bake 20 to 23 minutes until toothpick comes out clean. Remove from pans; cool on a wire rack.